For other things abbreviated R.O.D., see Rod. "Papermaster" redirects here. For the former Senior Vice President of Devices Hardware Engineering at Apple Inc, see Mark Papermaster. R.O.D: Read or Die (リード・オア・ダイ, Rīdo Oa Dai) is a series of light novels written by the Japanese author and artist Hideyuki Kurata, published under Shueisha's Super Dash Bunko imprint. Read or Die follows Yomiko Readman, codename "The Paper", an agent for the (fictitional) Special Operations Division of the British Library. There are currently 11 Read or Die novels. In volume 11, a note stated that the series would end with the upcoming volume 12. In June 2016, it was announced via Twitter that volume 12 would be released in August, and that there would be a volume 13. Along with the novels, Kurata scripted the official R.O.D manga illustrated by Shutaro Yamada, which was originally published in Ultra Jump magazine and later printed into four paperback volumes, and Read or Dream, a manga illustrated by Ran Ayanaga set in the same universe as Read or Die. The popularity of the Read or Die novels and manga resulted in the production of Read or Die (OVA) in 2001, which was directed by Koji Masunari and produced by SME Visual Works. In 2003, Aniplex produced R.O.D the TV, a 26-episode animated television series, which served as a sequel to the OVA and introduced Read or Dream's characters to those from Read or Die. 25 February 2012, a new manga called R.O.D Rehabilitation started in the Super Dash & Go magazine, the story tells of a city created by Bibliomania, Bibliopolis. On August 22, 2016, the twelfth light novel was announced, slated for release on August 26. The possibility of a new R.O.D anime was also hinted at in the announcement. Read or Die takes place in an alternate history world where the British Empire has remained a major superpower. The Empire's continued existence is guaranteed by the British Library (大英図書館, Daiei-toshokan), an external intelligence agency working within the actual British Library; its Special Operations Division (the British Secret Intelligence Service, more widely known as MI6) is also often mentioned, despite Kurata's editors (erroneously) telling him it no longer existed. The series follows Yomiko Readman, also known as "The Paper", a superhuman agent of the Library's Special Operations (possessing a "double 0" certification that denotes a "license to kill", as in the James Bond series, although she rarely invokes it). In both the novels and manga, her adventures alternate between doing missions for the British Library and helping young novelist Nenene Sumiregawa. Only the first novel and first manga have similar stories, involving rescuing Nenene Sumiregawa from a vicious kidnapper. Otherwise, the novels, manga, and animated versions of the stories have divergent plotlines. While characterizations are usually consistent even when storylines are not, some characters have different origins in different versions of the story, or do not appear at all. Still, it's mostly an ongoing story told through different media from the novels to the animated series so far. The British Library is an institution devoted to the promotion of literacy and the greater glory of the British Empire. More than a mere library, the British Library is a powerful political organization with branches all over the world. The organization is led by Gentleman (ジェントルメン, Jentorumen), an old man of extreme longevity and the power behind the throne of the British Empire. The British Library Special Operations Division (大英図書館 特殊工作部, Daiei-toshokan Tokushu-kousakubu) is the secret enforcement branch of the British Library. Based in a giant underground complex concealed beneath the Great Court at the British Museum, the Special Operations Division employs a number of agents with special powers and runs operations all over the world to fight book-related crime and terrorism, and to acquire rare works for the Library. Their slogan is "Peace to the books of the world, an iron hammer to those who would abuse them, and glory and wisdom to the British Empire!" Yomiko Readman (読子・リードマン, Yomiko Rīdoman) is a half-Japanese, half-English papermaster (紙使い, kamitsukai), an individual with the ability to control and influence paper. A substitute teacher in her spare time, she is the 19th British Library agent to earn the codename "The Paper" (ザ・ペーパー, Za Pēpā). Her name is a play on her nature as a bibliomania—the verb "to read" in Japanese is pronounced yomu. Joker (ジョーカー, Jōkā) is the acting head of the Special Operations Division. A stereotypical Englishman, his cool head and skill with words are his primary weapons. He secretly wants to become the actual head of the Division and gain control of the whole country. Wendy Earhart (ウェンディ・イアハート, Wendi Iahāto) is a half-Indian, half-English girl. She joined the Special Operations Division at 19 years old, and soon became Joker's personal secretary. She is earnest and devoted, but clumsy and still an "in training" assistant. Jiggy Stardust (ジギー・スターダスト, Jigī Sutādasuto) is the Special Operations Division's resident scientist, an aging man whose knowledge of paper is unrivaled. He developed the combat-use paper (戦闘用紙, sentōyōgami) Yomiko uses. Nancy Makuhari (ナンシー・幕張, Nanshī Makuhari) is a 26-year-old agent; in the novels, Joker recruits her in China. Codenamed "Miss Deep" (ミス・ディープ, Misu Dīpu), her special power is called "diving", the ability to become intangible and pass through solid objects. "Diving" can be suppressed through the use of paper charms (御札, ofuda). Nancy does not appear in the manga, and has a different origin in the anime where she is one of two clones of Mata Hari. Drake Anderson (ドレイク・アンダーソン, Doreiku Andāson) is a veteran of the American special forces, employed by the Special Operations Division as a field support operative mercenary for their agents. Drake is a hardened, no-nonsense soldier. Though he has no super-powers, he is incredibly strong, and a highly skilled soldier with considerable combat experience. Anderson has a young daughter named Maggie, whom he cares for deeply (Maggie Anderson is not to be confused with Maggie Mui from Read or Dream). He is also kind hearted and will not harm children, even if it goes against the mission. Dokusensha (読仙社) is the series' main antagonist, a secret organization based in Sichuan devoted to Chinese supremacy and led by China (チャイナ, Chaina). Known as Grandma (おばあさん, Obaa-san) to Dokusensha's high ranked agents, China is a "little girl" who, like Gentleman, has lived for a long enough time to know the hidden history of humankind. Nenene Sumiregawa (菫川 ねねね, Sumiregawa Nenene) is a Japanese world-famous author. Her debut novel Kimi ga Boku o Shitteru (君が僕を知ってる) was written when she was just 13. Nenene became acquainted with Yomiko when she worked briefly as a substitute teacher at Nenene's school. After Nenene is abducted by a crazy fan and subsequently rescued by Yomiko, the two become friends. Donnie Nakajima (ドニー・ナカジマ, Donī Nakajima) is Yomiko's deceased mentor and lover. The agent known as "The Paper" before Yomiko, he died at her hands under mysterious circumstances, yet Yomiko recalls that she killed him with her power. She now wears his glasses in his memory, and believes that reading through them enables him to continue reading as well. Faust (ファウスト, Fausuto) is a prisoner of the British Library. Like Gentleman and China, he has lived for hundreds of years and, because of it, Gentleman trapped him to hide the secret. The Read or Die manga series was written by Hideyuki Kurata, illustrated by Shutaro Yamada, and published in Shueisha's Ultra Jump from 2000 to 2005. It was later collected into four bound volumes by Shueisha and later licensed for translation and release in North America by Viz Media. Based on the Read or Die manga series, the film was directed by Koji Masunari and released in early 2001 in Japan by Studio Deen in early 2001 and outside Japan by Manga Entertainment in 2003. The story, featuring main characters such as Yomiko Readman and Joker, is a continuation of the Read or Die storyline, taking place a few years after the events of the manga. R.O.D the TV is a 26-episode anime television sequel to the Read or Die OVA, animated by J.C.Staff and produced by Aniplex, directed by Koji Masunari and scripted by Hideyuki Kurata, about the adventures of three paper-manipulating sisters, Michelle, Maggie and Anita, who become the bodyguards of Nenene Sumiregawa. 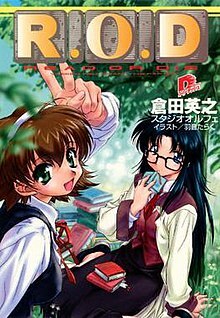 Its official title of R.O.D -THE TV- is a catch-all acronym referring to the inclusion of characters from both the Read or Die novels, manga and OVA and the Read or Dream manga, which revolves solely around the Paper Sisters. ^ Santos, Carlo (October 31, 2006). "Ode to Nodame - RIGHT TURN ONLY!!". Anime News Network. Retrieved August 7, 2018. ^ "Read or Die's Final 2 Novel Volumes Scheduled After 10 Years". ^ "New "Read Or Die" Anime Being Considered". ^ "R．O．D 1" (in Japanese). Shueisha. Retrieved March 24, 2019. ^ "R．O．D 2" (in Japanese). Shueisha. Retrieved March 24, 2019. ^ "R．O．D 3" (in Japanese). Shueisha. Retrieved March 24, 2019. ^ "R．O．D 4" (in Japanese). Shueisha. Retrieved March 24, 2019. ^ "R．O．D 5" (in Japanese). Shueisha. Retrieved March 24, 2019. ^ "R．O．D 6" (in Japanese). Shueisha. Retrieved March 24, 2019. ^ "R．O．D 7" (in Japanese). Shueisha. Retrieved March 24, 2019. ^ "R．O．D 8" (in Japanese). Shueisha. Retrieved March 24, 2019. ^ "R．O．D 9" (in Japanese). Shueisha. Retrieved March 24, 2019. ^ "R．O．D 10" (in Japanese). Shueisha. Retrieved March 24, 2019. ^ "R．O．D 11" (in Japanese). Shueisha. Retrieved March 24, 2019. ^ "R.O.D 1". Shueisha. Archived from the original on January 23, 2005. Retrieved March 24, 2019. ^ "R.O.D: Read Or Die, Vol. 1". Viz Media. Archived from the original on December 23, 2010. Retrieved 20 October 2009. ^ "R.O.D 2". Shueisha. Archived from the original on May 8, 2005. Retrieved March 24, 2019. ^ "R.O.D: Read Or Die, Vol. 2". Viz Media. Archived from the original on December 23, 2010. Retrieved 20 October 2009. ^ "R.O.D 3". Shueisha. Archived from the original on May 8, 2005. Retrieved March 24, 2019. ^ "R.O.D: Read Or Die, Vol. 3". Viz Media. Archived from the original on February 8, 2010. Retrieved 20 October 2009. ^ "R.O.D 4". Shueisha. Archived from the original on May 8, 2005. Retrieved March 24, 2019. ^ "R.O.D: Read Or Die, Vol. 4". Viz Media. Archived from the original on February 8, 2010. Retrieved 20 October 2009.